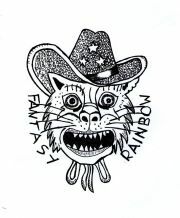 Fantasy Rainbow is an indie band from Manchester led by Oliver Catt. It's an odd sort of band though as the number of members apparently varies from a one man outfit up to three or four. They have recorded and released the ‘Teens’ EP, the ‘Healthy Lung, Dirty Lung’ cassette and the ‘No Hope. Not Ever’ EP and thanks to regular national airplay from XFM, BBC 6 Music & Amazing Radio, the first two sold out. Now signed to Heist or Hit records, they have recorded a new single - "O, Wierdo". After the single was recorded, Oliver travelled to Nashville, Tennessee to record the debut album at the Sputnik Sound Studios (run by Grammy Award winning producer, Vance Powell). The album is being produced by Ed Spear and is scheduled for release by Heist Or Hit Records in November 2012. Judging by this single, the album should certainly be an interesting release thats well worth a listen. It's a very enjoyable single - it's guitar based indie music with a quirky fun feel to it. It's one of those releases that's quite hard to describe and really you need to listen to it yourself to decide if it's your kind of thing or not. Personally although it's not the sort of thing I'd normally listen to, I do actually like it. Definitely worth checking out for Indie lovers.